The so-called dangerous RCMP “precedents” in Wet’suwet’en are actually standing operational policy. The people in the photo above are the stragglers who were still around when we remembered to take a photo. they are screenshots from this video OR this video. From the moment of the Wet’suwet’en call-out for international solidarity actions, we Sikniktuk water protectors knew we had to do something. What the Wet’suwet’en were going through, on the opposite coast of Canada, was all too familiar to us. It is wrong. Both their territory and ours are unceded. In both cases the Indigenous People’s were saying “no” to the proposed industry on their lands. In both cases there are several Supreme Court of Canada decisions that specifically establish the rights of Indigenous people to protect the resources on these unceded territories. 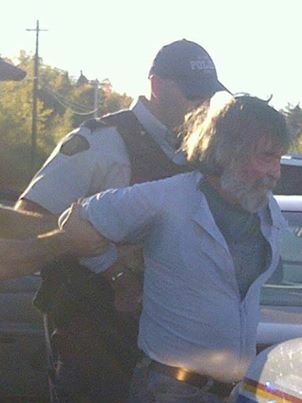 We both met unconscionable aggressiveness and disrespect from the RCMP. These are just of few of our similarities. This solidarity message from Unist’ot’en meant a lot to us, back in 2013. 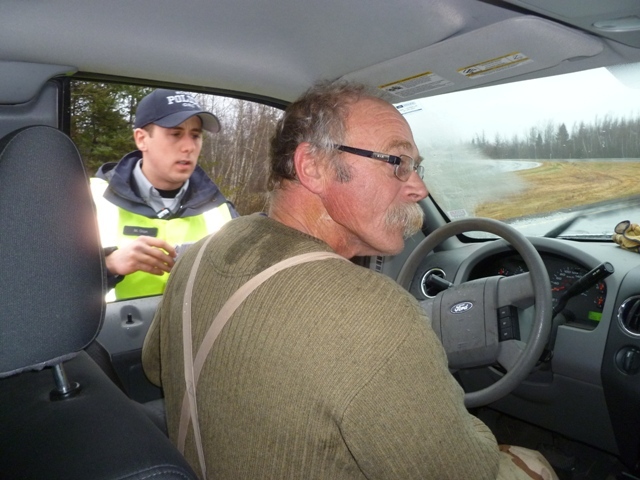 We faced the RCMP as corporate enforcers for the fracking company SWN Resources Canada everyday, for seven months, in Kent County NB/Sikiniktuk Mi’kma’ki, (aka “Rexton” or “Elsipogtog”). Things got especially rough in mid-October, which is when this message arrived. 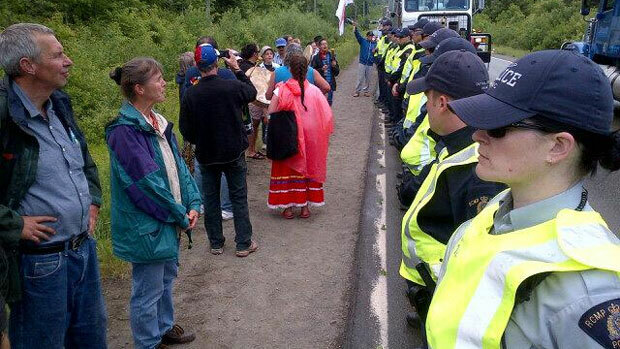 In the first few weeks of our protracted defence of our water, back in June 2013, we met local RCMP on the frontline. 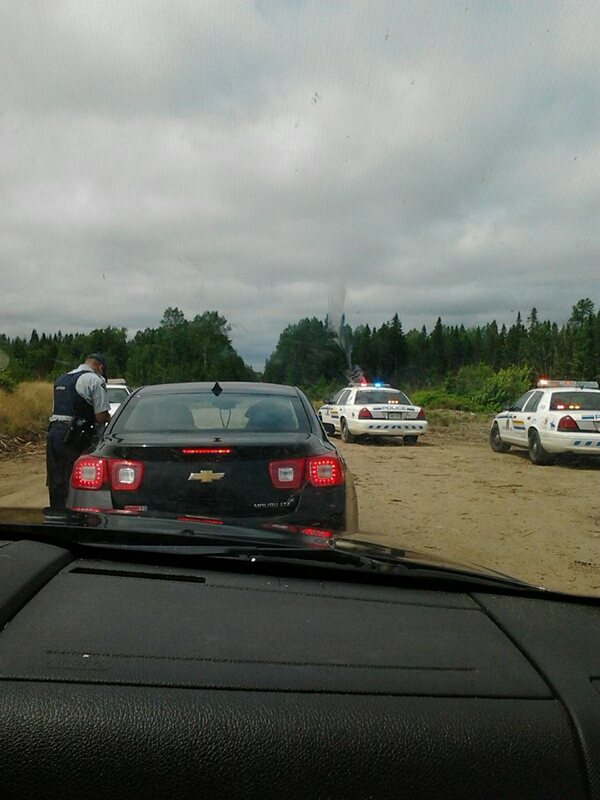 Then we started seeing RCMP troops coming in from outside Sikniktuk. Here is a map of our Mi’kmaq district, from this Radio-Canada link). The imported RCMP troops chased us around for months. 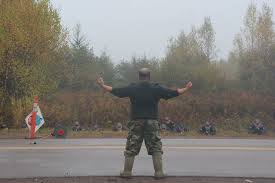 In mid-October, with days of precision planning including the apparent use of provocateur agents and infilitrators, the RCMP servants to the government of New Brunswick and SWN invaded our non-violent camp on Route 134 in Rexton. They said it was to enforce SWN’s corporate civil law injunction based on a SLAPP suit and extraordinary claims for damages. Actually the RCMP invasion was all about rescuing the SWN “thumper” seismic testing truck that was being held behind a barricade by peaceful water protectors. The purpose of that equipment was to find the best place to start drilling, in order to frack for shale gas. Our primary strategy since June was non-violently resisting, by standing or sitting in front of the trucks, to stop the company from collecting this data. 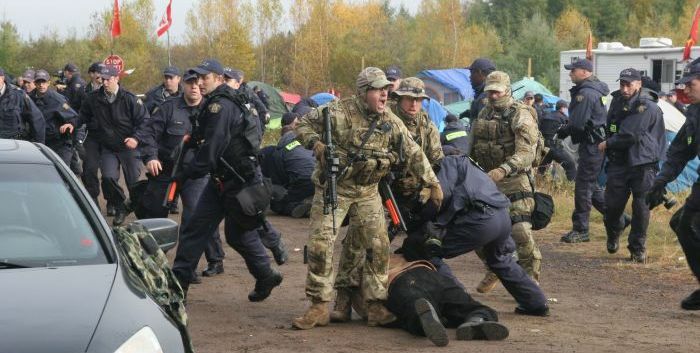 When they invaded our camp on October 17, 2013, the RCMP imported 200 or so tactical and riot control RCMP. They came from at least four different divisions, if we go by their different outfits. There were issues about RCMP conduct from the get-go. Based on these, the Civilian Commission mandated to review and report on RCMP complaints struck a Public Interest Investigation by the end of July. Complaints sky-rocketed after October 17th. As the Commission’s investigation got underway, they met stalls and run-arounds, blank responses and inconsistencies. These raised more questions, and the Chairperson of the Civilian Commission filed his own complaint to the RCMP. 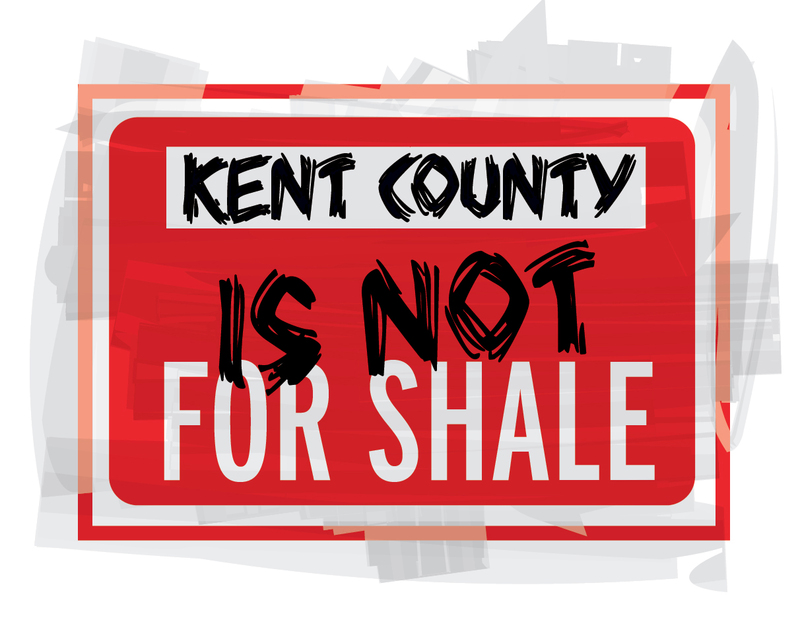 “The December 17, 2014, Chair-initiated complaint will examine the conduct of those members who responded to, or managed the response to, the Kent County shale gas protests in 2013, including a policy and practice perspective,” says their website. Countless people were “caught and released,” driven away from the protests and let go, sometimes in difficult circumstances. Over a hundred people in all were arrested. Some served jail time. Many were released on “conditions” that required them to stay away from protests, even our events and meetings. More than two dozen were actually named in the two SLAPP suits that formed the legal basis for the injunctions. Many of us SLAPPed had to countenance the threat of losing what we own, to make up for SWN’s so-called “damages” due to our resistance. My SLAPP suit paperwork. 22 other people also got this. None of us can forget how the RCMP acted and manipulated, the dehumanizing and viciousness. As the resistance built, the Indigenous water protectors led the way, and bore the real brunt of the resistance at the hands of the RCMP and the rest of the “justice” system. For all of us, especially the Acadians and Anglo settlers in our unified movement, this was an eye-opener, about how the Corporatocracy of Canada operates. Those who still had some faith in our “democracy” (where politicians respond to grassroots peoples’ views) were deeply shaken in 2013. In response to the call for action from Unist’ot’en last week, we immediately decided to gather mid-day on the road by the RCMP station in Richibucto. This station is closest to where the massive RCMP invasion of our water protection movement happened a little over five years ago. While it was clear why, when and where we would rally in solidarity with the Wet’suwet’en People, what we would do was not. We did not expect many people. In this sparsely populated rural area, many people live close to the edge financially and do not have gas money to spare. The plan was for midday on a Tuesday. It was -20C outside. There was no way we could build a fire to stay warm in front of the cop shop! But, the real reason we did not expect many people goes much deeper. To this day, many of our water protectors are still affected by the “state” coming down so heavy on them. To say our communities were traumatized and embittered by all of this is not an overstatement. For starters, I had not notified the RCMP of our intent to gather at their station. So, there we were, in their parking lot with banners, signs and flags. I knew we had to go into the station and explain why we were outside. I expected no trouble with this. Though some newbies cycle through this RCMP detachment, the regulars at this station live and work in this area. These are our local guys. The ones we call for domestic, vehicle, theft, and other issues. It was their water and communities we were protecting, as well as our own. …In their hearts, they know this. My worldview insists that inside everyone there is a conscience, though sometimes this is turned off by training, or by bitter experience. Above all, we had to try to communicate somehow with the RCMP so they could feel what their actions do to people. They must not be allowed to avoid understanding the consequences of their actions. This is the only way we can hope to rehumanize some of them, to reclaim them for the hard immediate work we have as a species, which is to change our behaviour, to save our single and only beloved shared planet. I asked the first half dozen arrivals: who wanted to go in with me? All seemed willing. As the cleansing Smudge passed, I became fully aware that each of us had something important to say to the RCMP about why we were there. I proposed we all go in to do that. We entered the RCMP detachment station in Richibucto, a large group, overfilling the waiting room lobby. (Eventually there were twenty of us.) I walked up to the recpetionist’s window and explained we were the people rallying outside with the signs and all, and we would like to speak with the most senior person in the station. A few moments later, Cpl. Dan Melanson came into the lobby and introduced himself. I said we were gathered outside in solidarity with the non-violent Wet’suwet’en water protectors and land defenders, and presented him with the pre-invasion statement from their Clan Leaders. 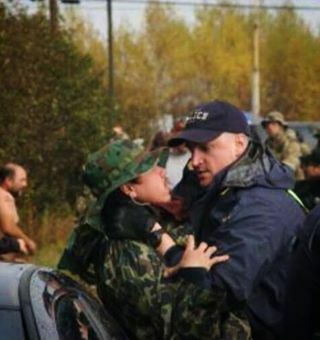 Wela’lin APTN reporter Angel Moore for being present and tweeting this photo. He said that “over here in New Brunswick, we do not know too much about this issue.” I said his heavily militarized riot and tactical RCMP colleagues in British Columbia had just forcibly entered Wet’suwet’en unceded territory to enforce an corporate injunction. This news took many of us here in Kent County/Siknitktuk back to 2013, when we experienced the same thing. We had come to share what we feel about this. In the case of the Wet’suwet’en People, there are clear legal reasons why it was wrong for the RCMP to invade their territory to push them out of the corporation’s way. Two Supreme Court of Canada decisions support the rights of the Traditional Clan Leaders to exercise jurisdiction over their original homelands, from “mountaintop to mountaintop” (the Tsilhqot’in Dcision), as recorded in traditional stories and songs passed down over the generations to hereditary leaders (the Delgamuukw Decision). All this is covered in detail in Why Canadian Law Should be on the Side of the Wet’suwet’en in the Pipeline Confrontation, by Bruce McIvor of First Peoples Law. Talking with Cpl. Melanson, some of us observed that the current Canadian government, led by Prime Minister Justin Trudeau, consisently says it supports the United Nations Declaration of the Rights of Indigenous Peoples. (A CBC news report covered the spectacle Canada made at the UN plenary session in 2016, when it officially adopted the Declaration on the Rights of Indigenous Peoples.) The invasion of Wet’suwet’en territory on January 7th, and the continuing occupation of their territory by the RCMP, violates more than a dozen Articles of that Declaration, including Article 30 as the RCMP acted as a military force in this instance, and when here in Sikniktuk in 2013. Another opinion offered to Cpl. Melanson is that The Indian Act Chief and Council have no jurisdiction beyond their reserve boundaries, so all the spin about how the RCMP are just enforcing “the rule of law” is bogus. The tired old argument about the “rule of law” surfaces whenever politicians and police act on behalf of corporations to repress peaceful dissent. Clearly, the “rule of law” was on the side of the Wet’suwet’en (SCC decisions, limitations of The Indian Act politicians, UNDRIP). “Under The Indian Act, elected councillors only have jurisdiction over reserve lands – the tiny parcels set aside for First Nations communities that are administered much like municipalities. That’s not where this pipeline would go. According to the Prince George Daily News, the RCMP are now planning to set up a temporary detachment in the area at the centre of this controversy. If feelings are running high, as they did here in 2013, this could lead to whole new crisis. In fact, the rule of natural law that underlies all of the resistance. That is why the Wet’suwet’en want no pipelines on their territory, why we refuse to allow fracking shale gas here in Sikniktuk, and substantially what motivated each of us to be present in the Richibucto RCMP detachment last week. There are huge social issues around our planet. Most are connected to the looming environmental collapse due to climate issues. Climate scientists’ international organization, the IPCC, recently released a report that says we have 12 years to limit climate catastrophe. 6,000 peer reviewed works are referenced in their report. “At the current level of commitments, the world is on course for a disastrous 3C of warming,” perhaps even more. (With our tarsands, melting icecaps, thawing muskeg, leaky pipelines and transportation systems, massive frack fields and hydro dams, monoculture tree plantations, 3 coasts of rising seas, abuse of salt waters, mega-agriculture, etc., Canada has a huge role in causation and vulnerability to disasters.) Even though change is slow, and many appear deaf to the facts, the IPCC report authors believe that “the increasingly visible damage caused by climate change will shift opinion their way.” Here in Kent County/Sikniktuk, we are already seeing the chaos and damage, and this is intensifying. To serve corporations and protect their assets. This man also mentioned community relationships. “Do you know the history of this region? 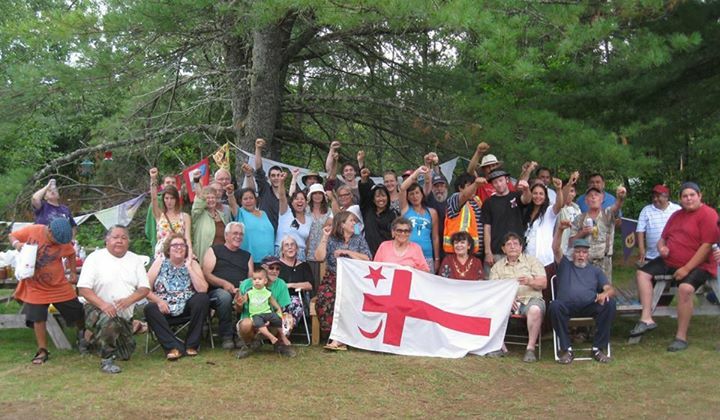 Do you realize that your Acadian ancestors were helped to survive by the Mi’kmaq people in the 1700’s in particular? How could you justify what happened in 2013?” Someone else mentioned the Peace & Friendship Treaty, the only treaty ever signed by the Mi’kmaq. It talks only about how nations of Peoples should get along with one another, no mention of surrendering land, title, or guardianship. Several people emphasized that we pay the salaries of the RCMP, who are meant to serve and protect everyone, not to serve and protect the corporations above all else. At least three of those present had read the recently published book, Policing Indigenous Movements. A Mi’kmaq water protector said that it was “very disheartening” to learn the extent to which people like him are considered national security threats and what the state is doing based on that conviction. A non-Indigenous person said it was really embarassing that the RCMP had this attitude. Here is a link to an article, called Why the RCMP may not be a neutral player in the Wet’suwet’en anti-pipeline dispute, in which one of the scholars who wrote this book is interviewed. Cpl. Melanson was one of the people who wrote down the title of this book. Someone commented they hope he finds time to read it. 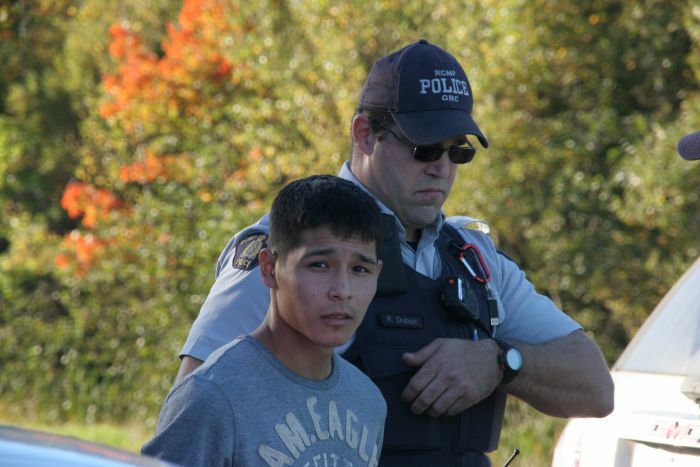 Mi’kmaq persons who were present at the RCMP invasion in our region in 2013 told Cpl. Melanson that many other people from Elsipogtog wanted to be there with us talking to him and rallying in support of the west coast water and land protectors. However, they were afraid to attend. Several commented that it was very good to have non-Indigenous allies present there with them. Workers can refuse to work if the conditions are unsafe, so the question was raised, “Can the members of the RCMP refuse to work if they are being asked to do something they think is not ethical?” Cpl. Melanson seemed to find this profound, and perhapssad. The community membnr who raised this suggested that, given the serious deep environmental and climate issues humanity is facing, supporting pipeline infrastructure construction by oppressing non-violent defenders and protectors is unethical. A non-Indigenous grandmother said that the world is in such a perilous situation environmentally that it is simply incomprehensible how the RCMP can justify to themselves that it is ok to promote further fossil fuel development. “It used to be that as a grandmother I would be thinking, should I start an savings plan to help with my grandchild’s education? Will they want to go to university? What will they do when they grow up? Now I think, will my grandchild have a planet on which to have a future? The topic of the Civilian Commission’s report came up. Here we are five and almost one-half years after the Public Interest Investigation was launched and we still have no report. 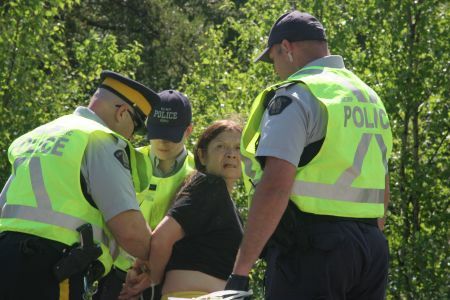 Numerous news stories and reports coming from Wet’suwet’en describe that they are going through the same traumatic brutality and callousness we experienced, see: First Nations arrested at B.C. checkpoint accuse ‘over-equipped’ RCMP of excessive force, also: People arrested at Gidimt’en anti-pipeline camp allege inappropriate use of force. “The actions in question [in Wet’suwet’en] resonated strongly* with those of us in New Brunswick who experienced the similar action of the RCMP raid on Elsipogtog over five years ago… with government employing the RCMP as an enforcement arm of fossil fuel interests; elevating commercial interests via an injunction over the larger and fundamental issues of civil rights, indigenous rights and international obligations at play. Hopes were expressed in front of Cpl. Melanson that we might see this report during our lifetimes. While it was felt that rank and file RCMP might be very interested to read and learn from this report,it was observed that sreluctance to allow this report to see the light of the day could well emanate from state security personnel (elected, uniformed, civilian) who believe their own hype that Indigenous rights activists, defenders and protectors are terrorists. The report would almost certainly challenge the dominant narratives about who is wrongright as well as critique official justifications for use of extraordinary measures. The underlying question of whether the RCMP should enforce private corporate civil court injunctions will have to be addressed as well. n this report. Another topic that was mentioned by several people was the RCMP protocol of excluding media. Here in Kent County/Sikniktuk it appeared almost accidental that the media could not get to the protest sites, where water protectors were preventing SWN Resources Canada from using their seismic testing equipment. 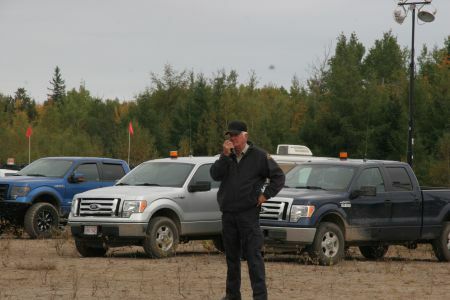 A combination of RCMP tactics – ranging from kettling the protestors and protectors, to creating barricades so no cars could pass through, to using the draconian terms of the second injunction to prevent reporters from stopping anywhere near the SWN equipment – all served to create a media exclusion zone. As person who often did media liaison work, I frequently heard reporters complaining they could not get to our sites to cover the stories. On the morning of the actual invasion, October 17, 2013, the only mainstream media that could enter the zone sealed off by the 200 or so militarized RCMP was the one reporter who came in with them, an “embedded” reporter from Sun News, who told only the RCMP side of the events. All alternative coverage came from social media, although early on the Halifax Media Co-op correspondent was able to send out some reports, until he was detained by police. A reporter from APTN found his way in at some point. Our area is not like the Wet’suwet’en Territory, in that there are multiple methods of access if one has the right vehicle, friends, and knowledge of the trails. The outrage about this strategy being used in Wet’suwet’en is encouraging. When it happened here in Sikniktuk, it was hardly mentioned in amongst all the other concerns. Now we see the issue rising above the din. The international Committee to Protect Journalists saying, “Authorities in Canada should immediately end the arbitrary restrictions on journalists covering the police breakup of the pipeline protest. Journalists should be able to freely cover events of national importance, without fear of arrest.” Apparently an RCMP spokesperson said the “temporary exclusion zone” was established to ensure public safety. It is worth noting that this is what RCMP commanders told me when I complained about the exclusion of media here in 2013. I argued that the presence of media would help ensure public safety, as we the public were the ones in danger from the company’s private security as well as those RCMP members with less self-control. While we could argue that the “precedents” were set here in Sikniktuk, or least the mechanics tested here, on January 8th many of us raised the same points as the three organizations above. In some ways, the time we spent in the Richibucto RCMP detachment lobby was like being in the opening round of a Restorative Justice Circle. Cpl. 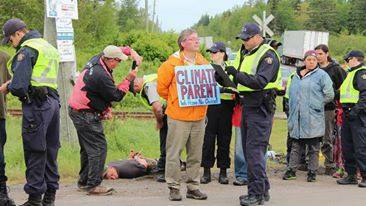 Melanson stood in for the entire RCMP force, as we shared our feelings from 2013 and strongly criticized the repeat operation that had taken place on Wet’suwet’en territory since the court appoved Coastal GasLink/TransCanada’s interim injunction. In my view, committed as I stubbornly am to non-violence, the only way we can change things in human relationships is through changing understanding, through person-to-person conversation. What we did was important in general, but specifically for a community like ours which has been through exactly the same thing as happened in Wet’suwet’en territory last week. For more than an hour, every time I looked at Cpl. Melanson, he looked very emotionally affected. Take a look at these images. You can also see more of him in the videos linked at the top of this blog, from which these still were taken. What I saw each time I looked at him was he was often reflective and looking somewhat sad, or as if aching inside to be hearing all this. Down. At times his body seemed limp. Never angry. Sincere mostly. No doubt he must also have been frustrated by some recounts and comments that were harsh but he made no effort to argue. Only once did he try to correct (and that was me!). Perhaps he was even a bit grateful to finally have the chance to listen to us. As we were leaving, he shook my hand and said he was happy to have finally met me in person. I think there were others in the room he must have felt the same way about, as there were at least five others present who were centrally involved in organizing and speaking publicly in 2013. Odd that it took this long to start the conversation. That shows our lack of imagination as well as their limitations. We are talking about doing something like this again. Personally, I am daydreaming about traveling across Canada, mobilizing local Indigenous-Settler alliances to go into cop-shops everywhere and try to get someone to sit down and talk with us. We have planet to save, and that starts with each of us. 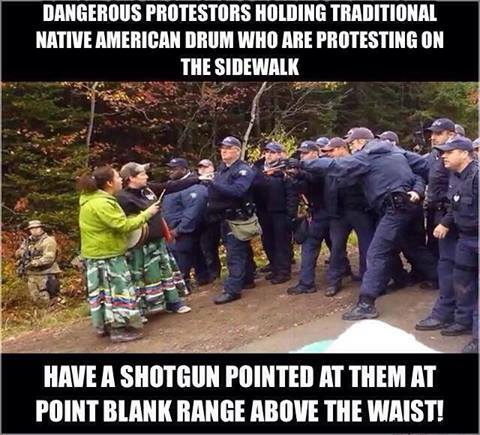 A strong and committed water protector pointed out to Cpl. Melanson that after all that was done by the company and the government, much of which the RCMP had to get their hands dirty carrying out, “It did not work. There are ongoing community tensions, and really you ended up creating more resistance” because of the force’s appalling behaviour. For me, I have been involved in citizen activism for peace and disarmament, anti-racism, civil rights, and international solidarity my entire adult life. In 1990, I was drawn into Indigenous human rights and solidarity work by the obvious injustices occurring at Oka/Kanehsatake. “Oka” was followed by the Old Man River, Ipperwash, Gustafsen Lake, Burnt Church, Elsipogtog, and now Wet’suwet’en. Personally I was only directly involved in solidarity work on a couple of these issues but I do know that the responses from the authorities to each of these have come from the same play book, albeit more sophisticated each iteration. It is no wonder to me that frustration is growing. Yes, of course, as my friend said, what the RCMP is doing is not working and it is only building more resistance and public support because it is so wrong. “We’ve been asked hundreds of times about lessons learned from the “1990 Oka Crisis.” Obviously Canada decided its lesson was to increase military training to its police forces. Few people realize Canada has signed many international human rights treaties and is required by some of these to report regularly to the UN Human Rights Committee on compliance issues inside Canada. Even fewer people realize that Canada’s treatment of Indigenous persons inside Canada has long been an ongoing concern for the esteemed human rights experts at the UN. Canada is trying to get an seat on the Security Council of the UN, which it lost during the Harper government period, in large part because of that regime’s handling of Indigenous rights issues domestically. So there is some potential leverage there, because the UN human rights experts welcome “shadow reports” from informed citizens and groups, who may speak of things that the nation-state (in this case Canada…) does not wish to make public. As well, there is an “Optional Protocol” procedure which allows specific urgent specific human rights violations to be brought directly into the UNHRC apparatus, provided the claimant can convincingly assert that their own rights have been affected. Because Canada is eager to impress the UN, these are tactics worth considering. “Disregard of indigenous rights of traditional lands ownership breeds tensions, subsequent violence and criminalization, as indigenous peoples become trespassers or illegal occupants of their own lands, subject to criminal charges… and removal from the lands they rely upon for their livelihoods, social and cultural cohesion and spiritual traditions. In the worst instances, escalating militarization, compounded by historical marginalization, results in indigenous peoples being targeted under national security acts and antiterrorism legislation, putting them in the line of fire, at times literally, by the army and the police (A/HRC/24/41/Add.3). Credit to tweets by Angel Moore at APTN for this image. We are civil society – all of us. This document is an attempt to do some of that sharing. I do think it would be useful for solidarious settlers to go in and talk, like we did, heart-to-heart, with local RCMP personnel in your area. We must make these conversations happen. Forget the politicians, they are all front men for the corporations. Talk to your local cops. I am not sure who said this, probably many wise revolutionaries, but we cannot change society until we bring the military and police on board. “The non-violent actions of Indigenous peoples at Unist’ot’en and Gidimt’en camps is an invitation to conversation. It is Canada who orders police and guns and ends any dialogue. 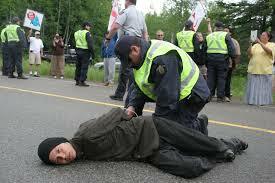 It is Canada perpetrating violence and arresting people on their land. It is Canada forcing people to accept what they don’t want. Send reply comments to me at coc.kent.county.nb@gmail.com. Wela’lin, merci, thanks. M’sit nokmaq. We are all related. *Note: that link takes the reader to Part 1 of my report on our rally at the Richibucto RCMP detachment. This is Part 2, dealing with what took place in the dialogue. This is a response to that call. 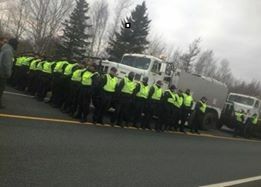 In the online request for submissions on hpw to “rebuild” the “relationship,” the Commission acknowledges hearing from many witnesses and complainants who expressed that the conduct of the RCMP during protests against fracking had led to a lack of faith and trust in the police force. The Kent County NB Chapter of the Council of Canadians also made a call-out: for ideas to be included in this response. Many people expressed profound doubt that anything could help with healing these wounds, the specific details of which are too numerous to mention here. the new style of hydraulic refracturing – called “fracking” – which is clearly dangerous. the provincial government used simple bluster and positive assertion to try to convince the public about the economic benefits and safety of deep shale gas fracking. 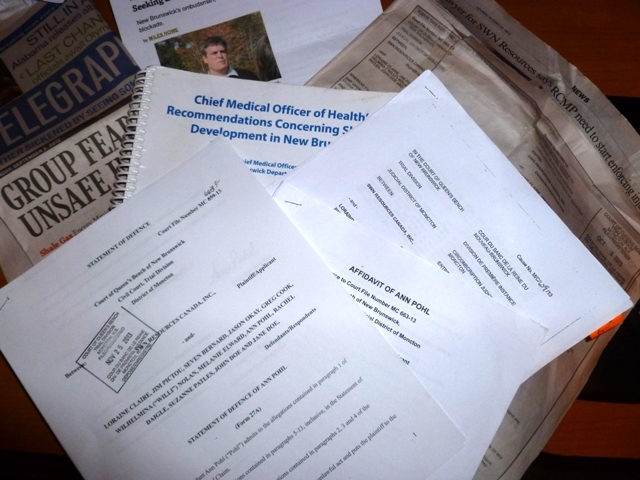 As the truth started to come out, especially in peer-acclaimed research on benefits, risk, and hazards found in the New Brunswick Chief Medical Officer of Health’s Recommendations Concerning Shale Gas Development in New Brunswick (September, 2012), it became evident that the government was losing its public relations war. environment and community health from fracking. Their public relations war was tweaked a few times, and ultimately re-aimed to focus on the danger of indigenous people and their environmentalist allies. As mentioned below, we can even identify the time period when the focus telescoped from saying we were all dangerous, to zeroing in on indigenous protectors as the primary targets. The “wrongs” committed in 2013 by officials during the anti-fracking actions are many – most severely: removals, arrests, charges, conditions, and sentences. These were often done in disregard for the pain inflicted, or the cultural and spiritual world of the protesters and protectors. spiritual attacks and illegal tactics such as “kettle-ing” did provoke some allies to lose their tempers, we were always standing firmly but non-violently in protection of our environment that sustains us. communities. We need a “peace officer” police force in whom we can have some trust and respect, and this is not presently the case. The first priority of the RCMP has to be the care and protection of the people in our communities. The RCMP must disassociate themselves from direct or indirect corporate control, whether this attempt to control comes through direct orders, or by persuasion from the corporations, or from governments who are promoting the corporate programs that threaten our communities. community, anger will continue to rise. The consequences of that could be alarming. 5. The Government of New Brunswick contracts the RCMP as the NB provincial police force. Because the force is first and foremost a federal one, Indigenous people in particular have established expectations and protocols regarding the RCMP. To a certain extent, so do all Canadians. 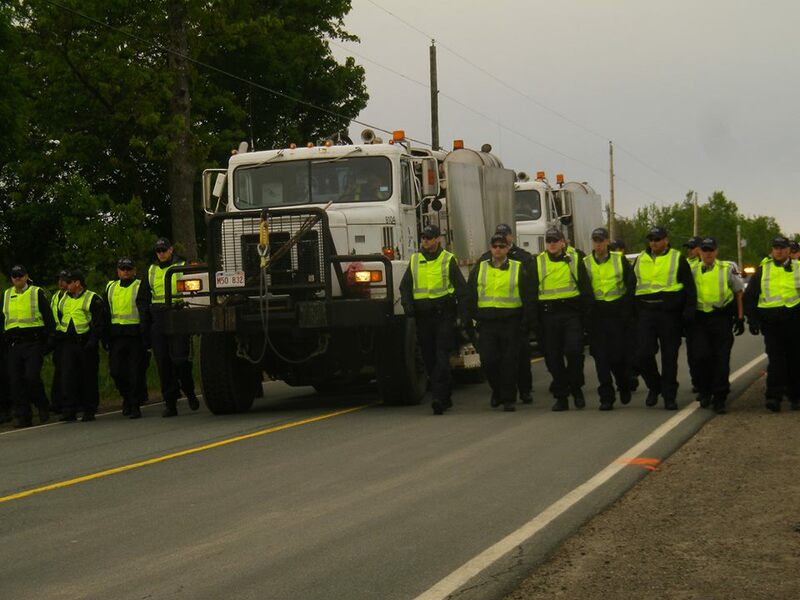 To enforce its pro-fracking policy, the New Brunswick provincial government exerted extreme influence and pressure on the RCMP to “break” the non-violent resistance of Kent County environmental protectors and protesters. This alone was the major factor creating the alienation between community members and the force. We knew that the RCMP were being used politically to advance a corporate/government agenda we opposed. None of the authorities cared to consider the relationship damage they were creating. With this mandate, the RCMP operated as a military-style force to implement the government policy that shale gas development would go ahead despite community uproar across the province. 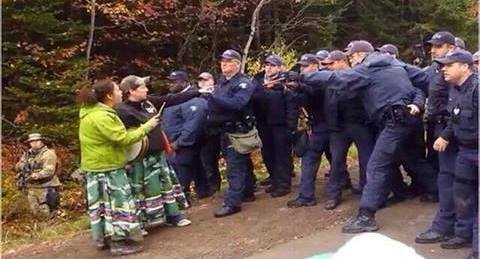 The criminalisation of protesters and protectors was a choice made by RCMP commanders who instructed the forces on the line. 6. 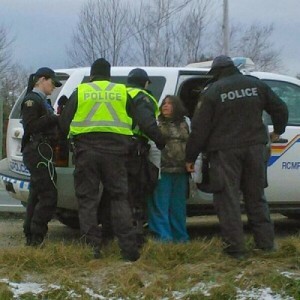 During the initial days of the corporation’s activity in Kent County (June 3 – June 20 2013), the RCMP appeared to be equally concerned with criminalizing both non-Indigenous and Indigenous activists, as they faced non-violent resistance from an united front of Acadians, Anglophones, Mi’kmaq, and other allies. However, by June 21, which is ironically National Aboriginal Day, the focus of the RCMP switched to total concern with Indigenous activists. The Commission has heard complaints from various individuals (both non-Indigenous and Indigenous) about this biased conduct, related to June 21 st and the following weeks and months. 7. This is a tightly networked rural area where most people know or are related to each other in some way, across all three founding cultural communities. 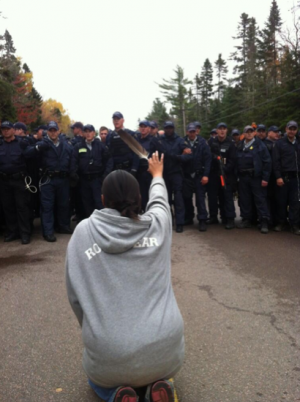 Many of the protesters and protectors also have extended family members employed in the RCMP. Informally through community networks, it is our impression that many officers with local Kent County RCMP detachments were not in agreement with the way that the force was commanded to operate during these months. The voices and reasons of these local peace officers, as to why they disagreed, should have been heard and considered fully. That is the way good community policing is done. 8. The events of October 17 2013 were the most obvious breach of people’s constitutional rights. Looking at an affidavit by Mark Lenehan, prepared by legal representatives for SWN Resources Canada on October 9 2013 (this has already been submitted to the Commission), we see quotes from an RCMP operational commander at the protest site. Sgt. Robichaud tells Mr. Lenehan that going into the 134 camp with Lenehan to serve papers re: the civil action injunction would amount to “inciting a riot” and “igniting a powder keg.” Ann Pohl (one of the contact people for this document) is one of the people specifically named in the injunction related to this affidavit. 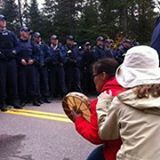 Prior to October 13 2013, when Ann visited the camp, she was assured by RCMP on duty at the police blockades (located at either end of the protest area) that she could enter the area without risking arrest. Specifically, she was told it was not the RCMP’s job to enforce a civil action injunction. Despite all the apparent tolerance and understanding by RCMP on duty during the weeks leading up to the October 17 commando raid on the protest site, we all saw what happened that day. On October 17, the RCMP’s callous disregard for human rights and safety of people was a stark contrast to their easy-going attitude in the weeks before. This deeply hardened community attitudes against the force. complete violation of the significance and protocols associated with this gifting. ♦ As it was being launched, all Kent County roads leading to the site were closed EXCEPT the roads that go from Elsipogtog First Nation. To many any people, this suggests that the RCMP were actually baiting First Nations people to come into the fracas that the RCMP troops were creating at the site, so that it would appear to the media and the outside world that the only people involved in the protest were Indigenous. ♦ Two very different stories were used to explain the rationale for the police assault. Early that morning, the RCMP brought in trucks equipped with powerful public address systems that were used to proclaim the civil law injunction as a pretext for the invasion. Yet, hours later, the RCMP commented they had to invade the protest camp because they had “intelligence” about a build-up of weapons on site and things were about to turn very dangerous. As there was almost no verifiable evidence of a weapons buildup, both excuses contradict what RCMP said a week earlier (see Lenehan affidavit). Dishonesty undermines public faith in the trustworthiness and credibility of our public servants. Your Commission is well aware of this view, from complaints and comments you have heard: unusual RCMP activity immediately before the fires appeared; querying what accelerant could actually cause the fires to start so quickly; failure by RCMP to protect the crime scene of the burned cars; why the cars appeared to be lacking standard police communications equipment; the possibility that the cars were deliberately decommissioned at a specialty shop the week previous; the cars were left at the road for so long after the burning; knowledge that such provocative acts have been done before by the RCMP; and many more points. Reinventing the Wheel: No Need for It! 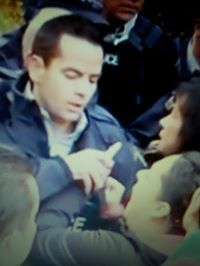 The RCMP have consistently attempted to insinuate that there are significant differences between those of us involved in the protests and protection actions, and that these differences follow cultural boundaries. interviewed by the Civilian Commission’s investigators were led into a field of inquiry about divisions between activists based on cultural heritage. We sincerely hope that these questions do not reflect biased attitudes by Civilian Commission personnel, and were asked only to determine the relative validity of information provided by the RCMP to the investigators and staff of the Civilian Commission. Indigenous protectors and protesters are addressed in the final Report of the Ipperwash Inquiry, submitted by The Honourable Sidney B. Linden (Inquiry Commissioner) on May 30, 2007 to the Government of Ontario. result in their irretrievable loss. It is the fault of the provincial government that Kent County neighbours and allies felt this desperate, but the RCMP needs to be a peace force for all the people, not for the government. food, etc., would be covered by the Commission. path to a productive dialogue on relationship building. and must be led by Indigenous educators from the regions where the RCMP serve.